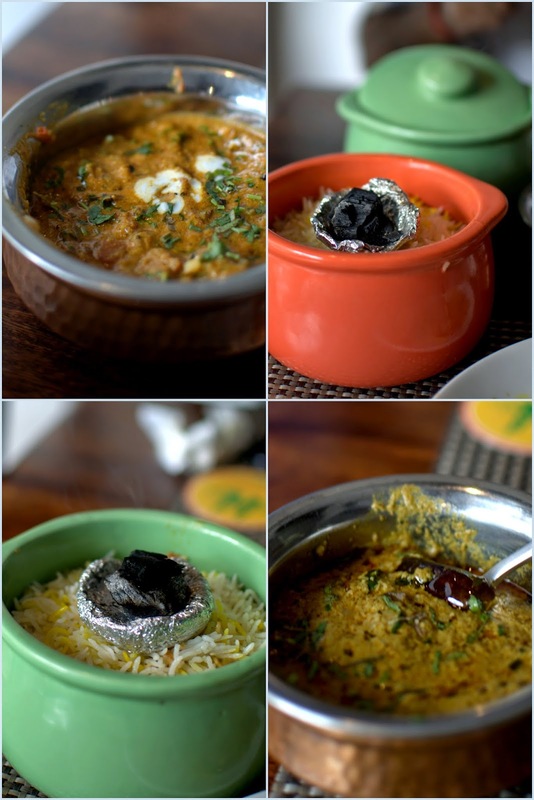 banaras ka khana: Smoked Biryani House ; authentic Hyderabadi biryani? Smoked Biryani House ; authentic Hyderabadi biryani? The mention of authentic Hyderabadi biryani is what lured us to a far flung restaurant in NOIDA (sector 18) and we were very kicked about it when we planned the day after a couple of months of almost constant travel. I crave for home cooked simpler food when I am back from travel but this Smoked Biryani House that claimed to serve Hyderabadi biryani made us plan for a long drive just to eat good Hyderabadi food. It is another story that we ended up being a bit baffled by the end. We were looking around sector 18 to locate the restaurant when we spotted a few home delivery vehicles with Smoked Biryani House carrier boxes, climbed up the stairs to enter a quite restaurant with comfortable seating, quaint ambiance. It was during Navratras and we were late for a weekend lunch, a good time if you want to avoid the rush hour. 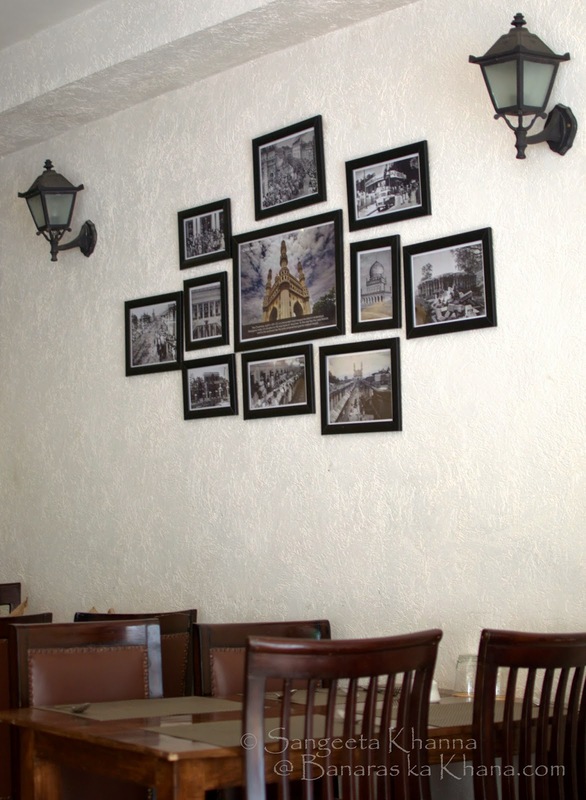 Seeing a constant stream of the delivery boys carrying home delivery packages downstairs and black and white pictures form the old city of Hyderabad on the walls had piqued up our interest as well as appetite as we waited for our orders to arrive. The restaurant manager came to talk to us and kept telling us stories about how the 'smoked biryani' came into being and how the Chefs are flown in from Hyderabad, we felt like eager hungry kids to dig into a cauldron of spicy Hyderabadi biryani. But we had to order a few starters before that and thank God we did so. The starters were all good. The best was Apollo fish, a new preparation for us, grilled fish smeared with minced ginger-chilly-coriander greens and bits of cashew, hint of tamarind and nice balancing of flavours, well done fish. We liked the Chicken 65 too, the Indo-Chinese of the southern variety, we have had a few versions of Chicken 65 and this one did not disappoint. Good amalgamation of textures and flavours that we liked. The Chennai version of Chicken 65 is different but we don't mind eating a hybrid dish changed a bit if it is still tasty. 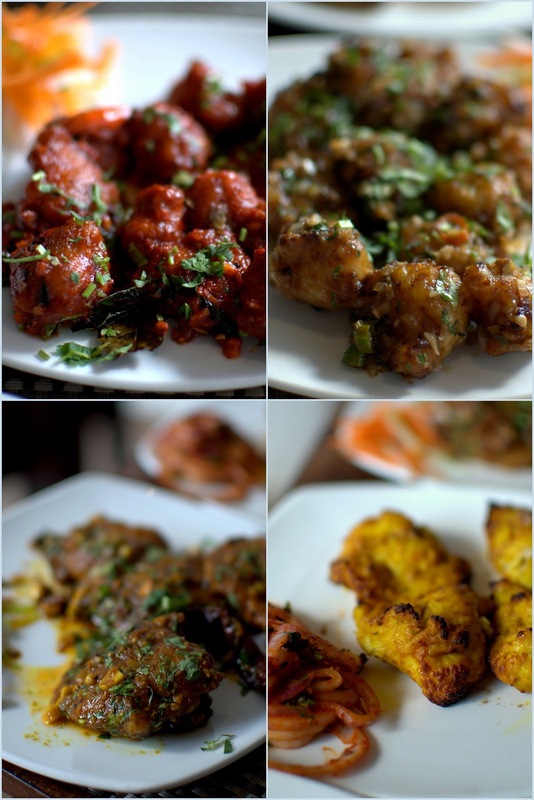 Veg Mancurian is another Indo Chinese fusion that surprised us, it was well made. We also ordered Shami kababs and Tandoori fish and found both of these good. Shami kabab can be found in many many variations as this is the most common kabab on every menu, this one was done well. Tandoori fish was succulent, well marinated Basa fish grilled perfectly. 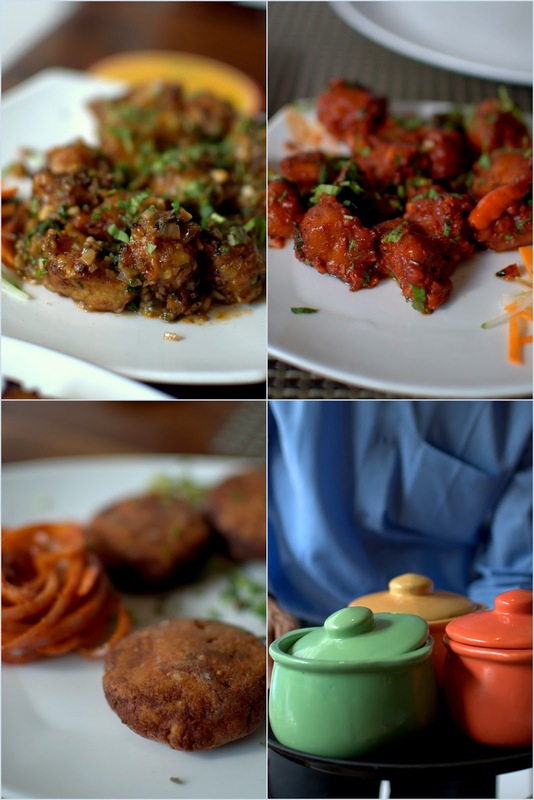 The red coloured onion rings served with the kababs and tandoori fish are good too. 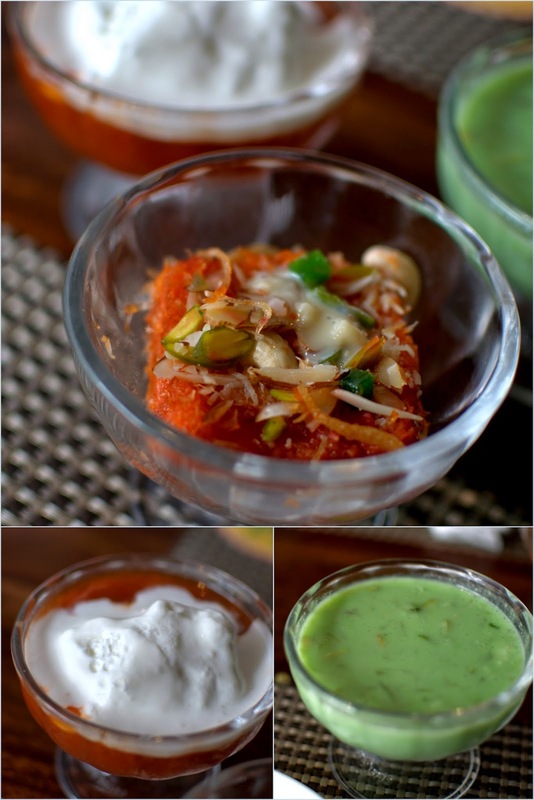 Note that there is no superlative goodness about these starters but each of these we tried were well done, good food at this price point (ranging from 200-300 Rs). But the story took a turn when we ordered the main course. The Andhra Mutton curry was a sad concoction that lacked flavours although it looked creamy and rich. We tried the Veg Biryani, the Chicken Biryani and the Mutton Biryani and ended up looking at each other. Biryanis are presented well here, with a smoking piece of charcoal placed over each potful of biryani but the biryani doesn't taste smoked nor it brings the Hyderabad taste to your palate. Why this biryani is named as Hyderabadi biryani? But to be honest, the biryani is not bad. The rice is long grained, well cooked and not greasy that I like in a biryani, the meat is well done, tastes good but there is no communication between the meat and the rice. I mean the rice grains have no flavour of the meat at all. A well made kachhe gosht ki biryani is much more flavourful. The veg biryani was good, actually better than we expected. But then again I was so happy with the Mirchi ka salan that comes with the Biryani and the Baghara Baingan that we had ordered. Both these were well made, true to their roots. I loved these so much I was thinking of ordering only Mirchi ka Salan and Baghara Baingan from this place the other day. Both are my favourite dishes and both were done so well. Clearly this restaurant is a new establishment that has become popular for home deliveries. But they have not been able to fix a few things although Chef Bilal from Hyderabad supposedly has worked at Paradise (the famous Hydrabad Biryani place). He probably made salan and baghara baingan at Paradise we concluded :-) He definitely needs to fix the biryani and the desserts. Oh I am yet to tell you about the desserts. DO NOT order desserts here is my humble advise. The Lauki ki kheer is loaded with nuts but excessively sweet and lacks any flavour. Khubani ka meetha is just too meetha to get any flavour of khubani, even the texture is bad. Double ka meetha is a suspicious piece of dense fudge that is drowned in synthetic colour and loads of sugar like the other counterparts. In fact all three desserts were made using synthetic colours. I gave my feedback to the chef and the manager and am hoping they will fix the desserts and the rest of the things soon. The staff is humble and courteous I must add. Service is good. I tasted a few few really good things here and a few of the worst too. The bigger concern I have here is the claim to be a Hyderabadi Biryani place and there is nothing remotely Hyderabadi in anything we tasted, apart from the mirchi ka salan and baghara baingan. There are better Hyderabadi biryanis in town, one is very close to our place in Old Rajinder Nagar opposite Rapid Flour Mill.